ich mag den Amethyst sehr gern und finde Dein Moodboard zart und bezaubernd. Even though it's not my birthstone, I used to have an amethyst ring. I like the color. Oh, diese Türe könnte mir auch sehr gefallen. 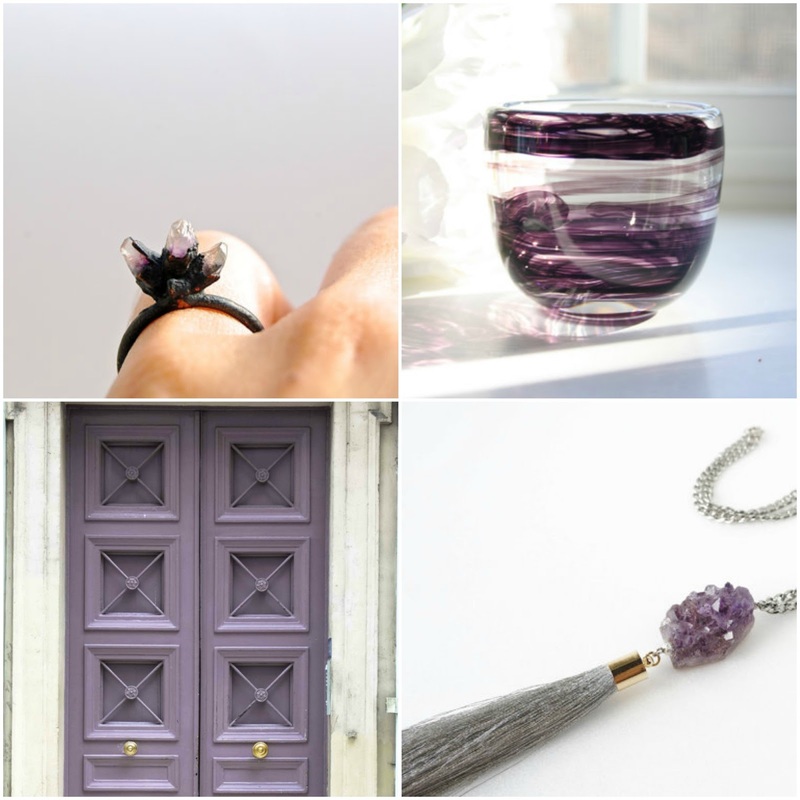 I love the colour of amethyst, and it's probably not a surprise that I adore those doors! Amethyst is such a beautiful stone! And I love that glass. My grandpa will be 93 later this month! oh ja, der Amethyst ist ein zauberhafter Stein, ich mag ihn auch sehr gern! Hab noch einen schönen Nachmittag, und falls Du in Düsseldorf bist, ganz viel Freude und Spaß!! I love this color, it is so mysterious! I love amethyst - especially the deep purple. Amethyst is one of my favorite stones. Such pretty finds! I love amethyst too and use it often in my jewelry making. Lovely choices for your mood board! Ooooh, I LOVE this stone! P.S. Thanks so much for your lovely words on my blog, you are so sweet & encouraging :) T.
Ich mag deshalb auch den Amethyst sehr. My sister, husband, and two of my grandparents all have February birthdays! I've always been a little jealous because amethyst is one of my favorites. Amethyst is a beauty! The jewelry pieces are stunning. So beautiful! My hubby has his B'day in Feb! Thank you so much for featuring Unicorns Love Sugar Moonbeams' Amethyst Spike ring in your lovely February mood board. Amethyst is such an amazing stone with calming properties and it's sparkling good looks don't hurt either. ;) Im so pleased you and your followers like the ring. Happy Friday!